As a teacher, I hated homework. I hated assigning it, and I felt bad that parents struggled to get kids to complete it. Research doesn’t support it, and, frankly, I’d rather have the kids practice with me at school than muddle through with their parents at home, often picking up misconceptions in the process. As a parent- well, I just hate homework for the regular reasons. Mostly because my kid doesn’t want to do it, but I’ve got to make her. If you find yourself in need of primary homework help, know that you’re not alone. Here’s some advice from me, both as a parent and teacher, that can help end your homework battles once and for all. This post contains affiliate links. You can read more details at our legal page. Thanks for supporting The Salty Mamas! Having a set time of the day when your child completes their homework can do wonders for ending homework battles. Some parents will want to get homework out of the way as soon as they return home. They find that kids are already in a “school” mindset, and are more willing to get their homework done as a result. At our house, this doesn’t really work, as we’ve got a toddler with a raging case of the Terrible Twos underfoot. So every night, when little bro goes to bed, Lila gets to stay up “late” (read: until 7:30) doing her homework. We get PJs on, brush teeth, and then she knocks her 10 minutes of homework out before crawling into bed with mom, where we do the required reading for the day in the form of bedtime stories. Experiment a little with set homework times, and try to find your sweet spot. It doesn’t much matter when it is, but keeping it consistent can make a huge difference in your homework routine. Every year, we make a big deal of stocking and setting up our homework caddy. 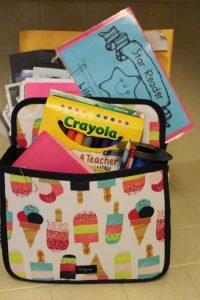 The Double Duty Caddy from Thirty-One is perfect for this (and they come in a bunch of fun patterns- consider letting your child pick their own!). If you need it a little quicker, we like the looks of this mDesign version on Amazon. We use one side of the caddy to house supplies that will offer primary homework help for your child. The other side helps to keep school forms, library books, and a completed work folder. Bringing the homework caddy to the table is part of our homework routine, and definitely helps to set the tone. Having the materials in one place helps to ensure that your homework time doesn’t get accidentally extended while you search for the necessary supplies. That means fewer excuses when it’s time to knock out some homework! I am a HUGE stickler when it comes to this timer, but not for the reason you might think. I’m not trying to make sure my daughter stays on task for a certain amount of time, or to institute breaks. Nope, this timer is to limit the amount of time we spend on homework, because enough is enough. Most school districts have official policies about how long children should be spending doing homework. One district I was in set a time of ten minutes per grade. My daughter’s current district recommends twenty minutes per grade. Whatever it is, there is an amount of time that is not meant to be exceeded. And I’m sticking to that. So if one night the homework is ridiculous, and we’ve been at it for twenty minutes with no end in sight- we stop. 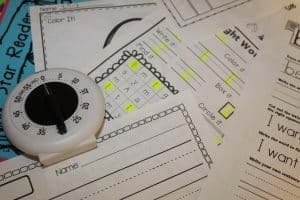 I literally draw a line on the worksheet, or add in a parent note at the bottom, that reads “we reached the 20 minute mark,” and then we put.it.away. Homework doesn’t have to be boring- even on the days when the homework is actually super boring. We try to make homework time quality time. We talk about what we’re doing (and sometimes go off topic), we take our time on the fun parts and rush through the boring parts. You can take homework seriously without making it overly serious. 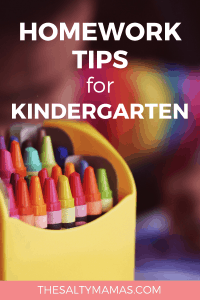 Try to keep in mind that this is one assignment, and one small portion of your child’s day. Treat it as such. Setting up the basics will get you started on the right foot when it comes to giving your child the primary homework help they need. Need more creative ideas? Stay tuned for our post on ideas to help even the most stubborn of kids finish their homework like rock stars! Sounds like a MUCH better fit. Wish all schools could be that understanding of kids’ needs!